The Frank J. Selke Trophy is probably the hardest award to dish out. It's given to the forward who best excels in the defensive aspects of the game, but measuring one's defensive prowess is nowhere near as easy figuring out who's the top scorer. Voters have plenty of metrics at their disposal -- takeaways, blocked shots, plus-minus, hits, faceoff percentage, shorthanded goals and even the old-fashioned eye test. Last season, Detroit's Pavel Datsyuk was the winner for the second season in a row. This season, there's no clear-cut candidate. There are plenty of worthy forwards who have excelled in all the aforementioned categories, including Vancouver's Manny Malhotra. But a freak eye injury in a game on March 16 cost him the final month of the season and perhaps a shot at his first Selke Trophy. 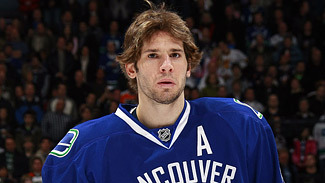 Ryan Kesler, Vancouver Canucks -- The two-time finalist had his load lightened by Malhotra's presence, but he never wavered in his defensive responsibilities while scoring a career-high 41 goals. After Malhotra went down, suddenly Kesler found himself matched up against the top scorers Malhotra was routinely facing. In tight-checking games against the Red Wings and Kings in late-March, Kesler showed he can still silence the best. Among forwards, Kesler finished fourth in blocked shots (80), tied for 14th in takeaways (65), tied for 11th in plus-minus (plus-24), tied for sixth in faceoff percentage (57.4), won 85.9 percent of his shorthanded faceoffs and scored three times while shorthanded. The Canucks finished tied for second in penalty killing (85.6) thanks largely to the work of Kesler. Patrice Bergeron, Boston Bruins -- While Kesler was a big reason why the Canucks allowed the fewest goals in the League, Bergeron was a big part of a Bruins club that allowed the fewest goals in the East. He led the Bruins in takeaways (49) and blocked shots (56). He tied for ninth in the League in faceoff percentage (56.6) and scored two shorthanded goals. His plus-20 ties him for 16th among forwards and is even more impressive considering the talent he was matched up against for most of this season. Frans Nielsen, New York Islanders -- His League-leading seven shorthanded goals jump off the page, but he's more than just that. Playing for a team that was outscored 188-153 at even strength, Nielsen finished plus-13. He tied for 12th in the League among forwards in takeaways (66) and showed his willingness to give up the body, blocking 63 shots, tied for 19th. His one flaw was in the faceoff circle, where he won just 46.2 percent of his draws. But the rest of his game warrants an invite to Las Vegas for the NHL Awards.